Personal Response to Disaster and Resilience: What is Higher Education’s Role? – Kendra Pierre-Louis October 2, 2017, Popular Science, There’s actually no such thing as a natural disaster Hazards are natural; disasters are manmade. At the beginning of the summer, while the sun was shining and students were mostly on vacation, I started working more closely with signatory schools on climate resilience planning. We are trying to make the complex process to “increase resilience” in the Climate & Resilience Commitments, broken down into manageable segments for campus Implementation Liaisons and community partners. I felt good about my efforts and was working on a deadline to prepare materials for the fall semester. We were empowering campuses to identify climate hazards and become future thinking planners who were addressing inequity through community-based partnerships. In this vision, colleges will eventually be very prepared to not only survive but thrive, when the worst of climate change effects “start” taking place. A few weeks later, while sitting in my comfortable home in Boston, I listened, watched, and read with dismay as stories of the damage wrought by earthquakes, one hurricane, and then more hurricanes rolled in, only to be followed by gun violence, devastating fires, and more earthquakes. I tried to learn more about these extreme weather events and violent events, I donated where I could to community-based relief efforts. I “liked” social media posts decrying lack of federal effort on climate change, but I am also a busy working parent, with deadlines and deliverables, so it all felt a bit abstract. It took having a close connection; to a colleague whose family is from Puerto Rico, to finally had a realization that I might just be trying ONLY to see the forest and purposely ignoring the trees in this resilience work. The students that are part of the Climate Resilience In Urban Campuses And Communities program are on the frontline in their communities, helping to build relationships between campuses and community to help identify and plan for disasters. When faced with immediate world disasters, where people were suffering great hardship and widespread destruction, I had to ask myself if I was I doing the most to take action personally and professionally to help people in need? I wondered if it was appropriate or worthwhile to point to pain and talk about how it could have been avoided. Or perhaps, because it was so uncomfortable, I was only planning for the future and avoiding connecting those real stories of current hardship? 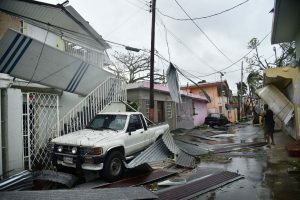 Residents of San Juan, Puerto Rico, deal with damages to their homes on September 20, 2017, as Hurricane Maria batters the island. The answers are never easy or straightforward. The quote that starts this post points to the complexity of this issue. We do need to both – attend to current needs AND plan to avoid them in the future, in our personal and professional spheres. We can support future looking international cooperative action, like the We Are Still In coalition supporting the Paris Agreement, and also donate for food relief. We can choose relief agencies that prioritize community needs. The stories in the wake of these tragedies have been full of much personal resilience, neighbors, and strangers helping each other get to safety and grieve during a tragedy. I do hope in the future the stories are about broader community resilience, and that there are shorter periods of time when people are in crisis. I hope that once the rebuilding starts, it can both happen quickly and help avoid similar scenarios, especially for the most socially vulnerable communities and individuals. Relief: Life-saving and getting minimal functions going for preserving life and reducing damage risks. Recovery: Help society move into a functioning stage so that people don’t need to leave and outside assistance can be reduced. Reconstruction: Measures to boost economic and social strength to pre-disaster levels (or, even better, better than pre-disaster). That lead to a fourth R – Resiliency: if that measure helps contributes to the potential for reducing future risks, we could hit a grand slam! One thing to I learned is that “better” should mean better for all and that even well-intentioned rebuilding efforts are not causing climate displacement or blaming victims long impacted by environmental injustice. There are many policy hurdles to overcome when rebuilding and our individual and institutional voices can be exerted to talk to elected officials about these issues while also implementing present day solutions. Institutions can provide comprehensive lists, such as the one put together by Syracuse University, for individuals to personally help relief efforts. However, what more can we do as part of the community of higher education climate and sustainability professionals across all of these phases— and to also avoid having the victims fade from our memories? Colleges and universities have specific and unique resources and connections. Let’s support new initiatives, research, and community engaged learning projects that incorporate all phases of the 4Rs. For example, I imagine alumni are doing wonderful recovery and resilience work and would be happy to share their stories on campus, or maybe be living in impacted areas and need continued support. To my colleagues, how have you struggled with and possibly started to answer these questions? Please email me with any suggestions that fall into any of these phases, and we can share immediately with the Climate Leadership Network and then also work to envelope new strategies into future Resilience and Climate Commitment planning resources. AASHE 2017 Conference is in San Antonio Texas; Our partners at AASHE worked to provide relief through Rebuild Texas. At SUNY ESF, a group of students and administrators have come together for relief efforts, Acorns to Action, and presented to the Chancellor. Providing this level of support is an excellent example. The Global Resilience Institute (GRI) at Northeastern University is an initiative involving all nine of its colleges, making Northeastern the first university to establish resilience as a university-wide focus.